I am not much of a prayer. I mean, I pray, but no one that knows me would put me in the category of "prayer warrior". In fact, I have trouble finding the time to pray and, even when I do find that, finding the words to pray. This is perhaps why I loved A Praying Life by Paul Miller so much. 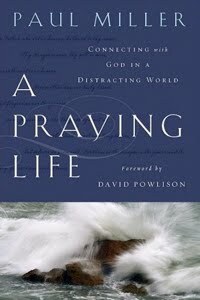 While it is packed with wisdom and helpful instruction, it is written by and intended for the struggling prayer. If you're like me, a book on prayer sounds about as appealing as a book on having your cavities drilled at the dentist (you and I were both wrong). Unfortunately, practice is much harder than principle. This is not a book to be rushed through. I would recommend a slow pace that allows you to implement the various disciplines and directives within. Believe me, it will be worth your time. Not only did the book read much easier than I expected, it really stuck with me. I have found myself quoting him often in my Community Group as the various challenges to prayer are common and widespread. Additionally, this book will be one I will loan and recommend often and it even made it onto my "read again" list (a surprisingly short list, believe it or not). Yes! What a great book, and you're right: without rushing through A Praying Life, the content and emphases have stuck with me. A book I'll return to often, I hope (and need).